Last Oasis takes place in a world where the moon has been destroyed and the Earth’s rotation has stopped. That creates two wastelands – an icy ruin on one side and a desert nightmare on the other – and the remaining humans are now stuck trying to survive on the strip of twilight in between. 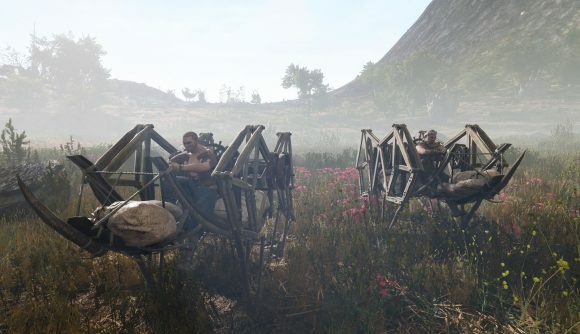 The sandbox survival MMO ticks a lot of the boxes you’d expect from the best survival games on PC, but the hook is in massive bouts of clan warfare where combatants are mounted on giant wooden mechs called walkers. Those walkers are used for travel and building in addition to combat, and can be upgraded with new bonuses and different sorts of attachments along the way. Eventually, that leads into giant clans between swarms of walkers, as demonstrated in the new trailer. The economy is intended to be player-driven, so that the need for resources drives all sorts of different playstyles – from harvesters and traders to pirates and mercenaries – so that a varied world full of player clans emerges as a result. We’ll see how those broader goals work out in the end, but I cannot overstate the coolness of these mechs. Just look at them. The game is scheduled to hit Early Access sometime this spring, and will remain there for “12 to 24 months.” In the meantime, you can sign up for a closed beta test ahead of the early launch. Last Oasis comes into a pretty crowded genre, but there’s enough unique flavour in this pitch to help it stand apart. Here’s hoping the game lives up to that initial promise, in Early Access and beyond.